The price of a degree keeps rising. But with payoffs like better jobs and higher earnings potential, college is usually still worth the cost. The data in this graph represents the average annual earnings of workers by education level. These hypothetical examples include only persons who were 25 years of age or older and the earnings are for full-time wage and salary workers. Source: U.S. Bureau of Labor Statistics, U.S. Department of Labor, Current Population Survey, 2015. This chart shows a direct correlation between higher education levels and higher average annual earnings. A worker with a high school diploma earns $35,256. A worker with some college education, but no degree, earns $38,376. A worker with an associate's degree earns $41,496. A worker with a bachelor's degree earns $59,124. 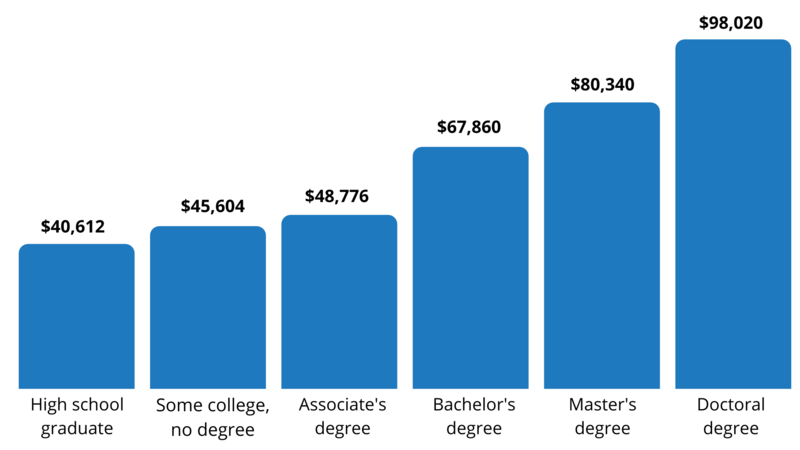 A worker with a master's degree earns $69,732. A worker with a doctorate earns $84,396.